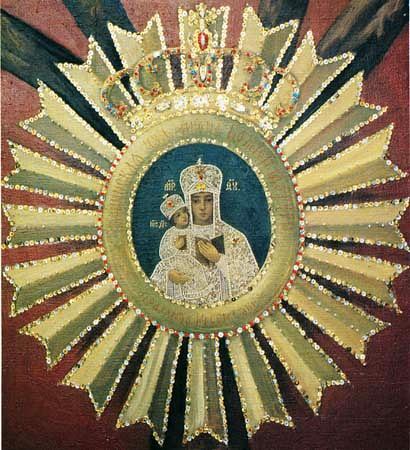 The Lesninsk Icon of the Mother of God was discovered on the feast of the Exaltation of the Cross of the Lord in 1683 by a shepherd on the branches of a pear tree and taken to a nearby Orthodox church of the village of Bukovich, not far from the town of Lesna. When news about the miraculously appearing icon circulated throughout all the surrounding area, the Catholic priesthood then decided to utilise the icon for spreading Catholicism. They took away the icon by force from the inhabitants of Bukovich in 1686 and put it in the Lesninsk Roman-church. At the beginning of the XVIII Century monks of a Catholic order founded at Lesninsk a large Roman-church and monastery, in which was situated in the wonderworking icon. In 1863 the monks of the order took part in the Polish revolt and, by decree of the Russian government, the monastery was closed and converted into an Orthodox parish. Many miracles were worked by the icon. The celebration of the Lesninsk Icon of the Mother of God is celebrated also on 8 September and 14 September.